Arthritis, an inflammation affecting one or more joints in the body, may cause pain, swelling and stiffness. The two main types of arthritis are osteoarthritis, a condition with deterioration of cartilage in the joint from overuse, injury or aging, and rheumatoid arthritis, an immune disease that destroys the tissue lining the bones of the joint. Physicians typically treat all types of arthritis with medicine to reduce pain and inflammation, but there are a variety of nuts that may help with arthritis pain as well. One of the best nuts to eat for arthritis is the Brazil nut. These nuts contain an abundance of selenium, a nutrient that controls free radicals; 1 oz. of Brazil nuts supplies 780 percent of the daily recommended intake of selenium. Free radicals can damage tissues in the body, including tissues that cover the bone ends in joints, which may result in rheumatoid arthritis. The National Institutes of Health Office of Dietary Supplements indicates that early findings suggest selenium is an important factor in rheumatoid arthritis, but more research is needed. Incorporating walnuts into the diet may provide benefits for arthritis sufferers. 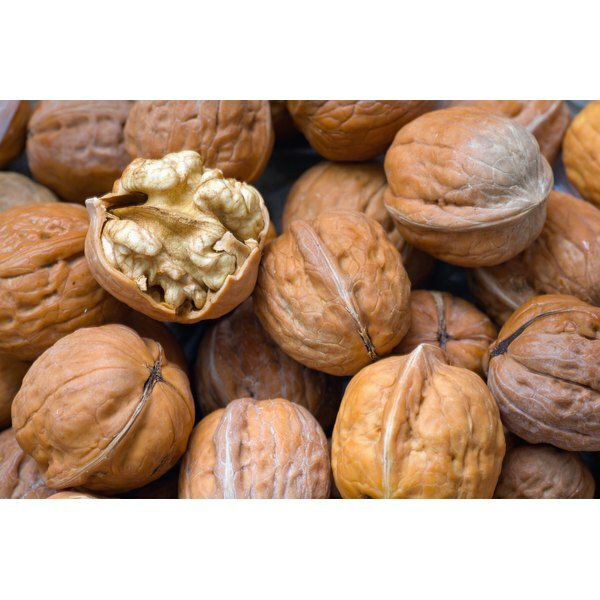 Walnuts, one of the best nuts for arthritis, are rich in omega-3 fatty acids, a type of fat that helps reduce inflammation and can help lower the risk of developing arthritis. A quarter of a cup of walnuts contains 94.6 percent of the daily recommended intake of omega-3 fatty acids. Cashews make the list of best nuts to eat for arthritis due to their high copper and magnesium content. Cashews contain almost 40 percent of the daily recommended intake of copper and 22 percent of the daily value of magnesium. Copper in the body helps control free radicals that can damage tissues in the body, resulting in conditions like rheumatoid arthritis. The George Mateljan Foundation for the World's Healthiest Foods website indicates a deficiency in copper may contribute toward the development of arthritis. Arthritis Today notes that some arthritis sufferers have poor bone density readings, a condition associated with a lack of magnesium. Eating cashews may help fight off rheumatoid arthritis for these reasons.